We’d love your help. Let us know what’s wrong with this preview of Deafening by Frances Itani. Elegantly written and profoundly moving, Deafening sent an uncommon roar through the literary world when it made its way into the hands of its first readers at this past year's Frankfurt Book Fair, and was immediately snapped up by twelve eminent publishers from around the world. Frances Itani's lauded debut novel is a tale of remarkable virtuosity and power, set on the ev Elegantly written and profoundly moving, Deafening sent an uncommon roar through the literary world when it made its way into the hands of its first readers at this past year's Frankfurt Book Fair, and was immediately snapped up by twelve eminent publishers from around the world. Frances Itani's lauded debut novel is a tale of remarkable virtuosity and power, set on the eve of the Great War and spanning two continents and the life and loves of a young deaf woman in Canada named Grania O'Neill. At the age of five, Grania-the daughter of hardworking Irish hoteliers in smalltown Ontario-emerges from a bout of scarlet fever profoundly deaf and is suddenly sealed off from the world that was just beginning to open for her. Her guilt-plagued mother cannot accept her daughter's deafness. Grania's saving grace is her grandmother Mamo, who tries to teach Grania to read and speak again. Grania's older sister, Tress, is a beloved ally as well-obliging when Grania begs her to shout words into her ear canals and forging a rope to keep the sisters connected from their separate beds at night when Grania fears the terrible vulnerability that darkness brings. When it becomes clear that she can no longer thrive in the world of the hearing, her family sends her to live at the Ontario School for the Deaf in Belleville, where, protected from the often-unforgiving hearing world outside, she learns sign language and speech. During this long war of attrition, Jim and Grania's letters back and forth-both real and imagined-attempt to sustain their young love in a world as brutal as it is beautiful. Frances Itani's depiction of a world where sound exists only in the margins is a singular feat in literary fiction, a place difficult to leave and even harder to forget. A magnificent tale of love and war, Deafening is finally an ode to language-how it can console, imprison, and liberate, and how it alone can bridge vast chasms of geography and experience. To ask other readers questions about Deafening, please sign up. There's not a single false gesture in Frances Itani's "Deafening." Despite its subjects - war, romance, disability - it's a story of careful, measured emotion, bleached of all sentimentality. The publisher has positioned the novel as a debut in America, but Canadians have been reading Itani for decades, and every page of this story betrays the hands of a mature writer who knows exactly what she's doing. The heroine, Grania O'Neill, was robbed of her hearing at the age of five by scarlet fever in There's not a single false gesture in Frances Itani's "Deafening." Despite its subjects - war, romance, disability - it's a story of careful, measured emotion, bleached of all sentimentality. The publisher has positioned the novel as a debut in America, but Canadians have been reading Itani for decades, and every page of this story betrays the hands of a mature writer who knows exactly what she's doing. The heroine, Grania O'Neill, was robbed of her hearing at the age of five by scarlet fever in the early 20th century. Itani narrates her life in a voice imbued with the cadences of the deaf girl's thoughts and sensibilities, a technique that submerges us in Grania's silent but vivid world, a place "divided into things that move and things that don't move." Her parents are too burdened by guilt and too mired in hopes for a miracle to work with their daughter's obvious intelligence, but her grandmother remains determined to teach Grania to read. The process, so tactilely described here, involves studying simple pictures and words, feeling her grandmother's throat, and attending to the slight fluttering of others' lips. Everywhere, there are traps and tricks, puns and homonyms, silent k's and g's, nonsensical idioms, and worst of all, mustaches that camouflage the shape of speakers' words. But "nothing will stop Grania," Itani writes. "When she is alone she stands on tiptoe on the stoop at the back, behind the laundry, and she watches her reflected mouth in the narrow window. Hetakesabite. She studies each word separately. She holds her voice as close to herself as she can. It is like pressing a pillow against her chest, the way the boy in the picture presses the book to his sailor suit." Showing Grania pull herself into the world of language so deliberately and with such extraordinary concentration, Itani reinvests words with an arresting power most of us have forgotten. But she wields that power with quiet, remarkable effect. After a brief stint in a regular public classroom being alternately ignored or pitied, Grania is sent away to a progressive school for the deaf, where she cries for two weeks and then resolves never to cry again. The training - in speech and sign language - is arduous, but Grania's grandmother provided a good foundation. "Her hands, to her surprise, and jerkily at first, begin to send ideas out," Itani writes. "Her face and body punctuate; her eyes receive. She is falling into, she is entering a new world. She is joining the larger conversation of hands." Soon after she graduates, Grania meets Jim Lloyd, a hearing man. I can't remember ever feeling so greedy for more details from a novel. Grania and Jim develop an intimacy intensified by their struggle to communicate with one other, and Itani's discipline as a narrator makes their courtship all the more striking. "She wanted to talk. The room was dark unless there was a moon, but she did not need the moon. She closed her eyes and raised the fingers of her left hand to his lips. Though at first he was astonished, he understood and began to speak. His careful words fell into her fingertips and she whispered back and they conversed like this, side by side." Married only two weeks, Jim is sent to France as a stretcher-bearer, and the novel splits into two very different stories: One remains with Grania in Canada, and the other follows Jim into the trenches of Europe. Their experiences couldn't be more different, of course. Itani constructs a striking juxtaposition between Grania's small, silent world and the cacophony of battle that her husband endures. But the author also hears the resonance between these two experiences: Jim's survival often depends on his ability to exercise the same attention as Grania to slight movements around him, and in the roar of shells and gunfire, his men resort to impromptu sign language. Back home, Grania battles the influenza epidemic that will eventually kill more people than the First World War. What's particularly remarkable about this novel is that Itani's quiet, measured style, which seems so effective for describing the simple details of domestic life, becomes downright stunning when employed in her descriptions of war. From Jim's initial burst of patriotic enthusiasm, through stages of blinding terror and nausea, he trudges on for years in a world "no one would believe." These anecdotes of unrelenting chaos, gore, and waste serve as a sobering reminder of the nature of battle before technology allowed us to pretend that the process of killing other people could be precise and antiseptic. Grania, consumed like so many women at this time with the tasks of waiting, clings to a few letters that manage to make it back to her, hoping guiltily that Jim, unlike so many others, will survive. Meanwhile, "Deafening" demonstrates a perfect ear for the tragic mingling of joy and grief at the arrival of a wounded loved one. Grania's brother-in-law, hideously disabled and shocked into silence, provides a frightening example of the alternatives to death in Europe. One of the novel's most beautiful sections involves her efforts to help this young man emerge from the fog of his pain. There are no miracles - for Grania or her brother-in-law - but the qualities she developed as a child, her fierce attention to language and the world around her, are not easily thwarted. It's a gorgeous irony and a testament to the power of affection when the one person in his life who can't hear finally makes him speak. "Sorrow can be borne," Grania's grandmother insists, and there's enough in this poignant story to reassure us of that promise and point to something beyond endurance. Indeed, there are passages here so beautiful that we can't help straining to hear more. I am not certain that this wasn't a good book, but at the very least, I, personally, was not in the right state of mind to read it. I felt like it had so much potential: an original story, an exciting setting, some very clever and poignant symbolism and resounding themes. Sadly, I was just never really hooked. I never felt engaged in this novel. I am not sure if that is due in part to an inability to connect to the characters. I had some interest in Jim and occasionally in our heroine, though I o I am not certain that this wasn't a good book, but at the very least, I, personally, was not in the right state of mind to read it. I felt like it had so much potential: an original story, an exciting setting, some very clever and poignant symbolism and resounding themes. Sadly, I was just never really hooked. I never felt engaged in this novel. I am not sure if that is due in part to an inability to connect to the characters. I had some interest in Jim and occasionally in our heroine, though I often found her stories to be tedious and dull. I have found, when reading novels that are set during war times in which some sections are told from 'at home' and 'over there' the stories of the characters who are away in battle are the most engrossing, leaving the tales of those who have been left behind to feel often a tad trivial. I did enjoy some parts of the exploration of Grania's struggles with her inability to hear. Itani seems to mirror some of Grania's struggles with those of Jim, who is away at war working as a medic. Beautiful. Epic in scope and feeling just like No Man's Land - parts where you were in the war, like Tolkien's book. Written with the beautiful prose like The Summer Before the War. Tell takes off from where Deafening ends in ways. Instead of the story of Grania, it is centered on Kenan, Grania's sister Tess' husband. So often throughout Deafening Grania would say "Tell", "Tell" when demanding information that she could not hear. I thought that was so interesting. I read Tell before Deafening, e Beautiful. Epic in scope and feeling just like No Man's Land - parts where you were in the war, like Tolkien's book. Written with the beautiful prose like The Summer Before the War. Tell takes off from where Deafening ends in ways. Instead of the story of Grania, it is centered on Kenan, Grania's sister Tess' husband. So often throughout Deafening Grania would say "Tell", "Tell" when demanding information that she could not hear. I thought that was so interesting. I read Tell before Deafening, even though I have had Deafening on my shelf for a long time. But at no time did I feel like I missed out because I read Tell first. In fact, I think I liked the order in how I read these two beautiful novels. Deafening is the time before and during the Great War and its impact on small town Ontario. Tell is the aftermath, the return of Kenan and his life in that same small town of Deseronto, Ontario. This review has been hidden because it contains spoilers. To view it, click here. I very much enjoyed the start of this book. I liked how Itani described Grania's education, and the development of her and Mamo's relationship. Itani had also delicately emphasised Grania's ability to perceive the world. But what I liked most was how the world perceived her. The way she interacted with others, and how others interacted with her. From Grania's mother, to her sister and grandmother and the people at school. They all interacted with her in different but realistic ways. Furthermore, I very much enjoyed the start of this book. I liked how Itani described Grania's education, and the development of her and Mamo's relationship. Itani had also delicately emphasised Grania's ability to perceive the world. But what I liked most was how the world perceived her. The way she interacted with others, and how others interacted with her. From Grania's mother, to her sister and grandmother and the people at school. They all interacted with her in different but realistic ways. Furthermore, because this was set in the early 1900s, there wasn't a lot of knowledge on how deafness worked, and how to approach the deaf. I liked reading about Grania's school. How they were taught, and how Grania eventually came to believe in herself and her ability to learn sign language. How she came to accept that she could be taught, in a manner of speaking. There was a gentle growth of self-assuredness, that she was worthy of learning. I also enjoyed reading about the other deaf students in the school. And throughout all of this, Itani managed to capture the essence of sound. How would you describe sound to someone who can't hear? It's like trying to describe taste without comparing it to other tastes. How would you describe vanilla ice cream, or a tomato, or yoghurt? Sweet, savoury, they can only go so far. And the same goes with sound. What is exactly is the sound of a car engine, or the tapping of keys on a keyboard, or the touch of a bow along a violin? This was all amazing, but in the second half of the novel, I felt Itani fell flat. It became a war story, which is all well and good, but I wanted to read more about Grania's growth as a deaf character. I felt the point of the novel fell flat. Jim and Grania's relationship just was. There was no development there. They meet and then they're married. What happened in between? Some parts of the war scenes were heavy handed. War is useless meets war is NOISY. How did this really meet with Grania's world? I just felt Itani wasn't quite sure what direction she wanted the novel to head in. A very unusual World War I story, told through the eyes of a young deaf woman named Grania. Poignant, well-told, powerful. Very enjoyable. FAVOURITE QUOTE: “If only he did not have to look at the hands. In death they told more than the face; he knew that now. It was the hands that revealed the final argument: clenched in anger, relaxed in acquiescence, seized in a posture of surprise or forgiveness, or taken unawares. Clawing at a chest, or raised unnaturally in a pleading attitude. How can this A very unusual World War I story, told through the eyes of a young deaf woman named Grania. Poignant, well-told, powerful. Very enjoyable. There are times when one does not want to hurry their way through reading a book. In the case of this one, it is doubly so. First because of the beautiful prose and second because of the subject matter. This was a beautifully written and wonderfully researched book regarding being deaf and learning to grow up in a hearing world. All of the characters are beautifully written and the landscape and weather in Ontario are as much a character in the story as the people in it. The second part of the s There are times when one does not want to hurry their way through reading a book. In the case of this one, it is doubly so. First because of the beautiful prose and second because of the subject matter. This was a beautifully written and wonderfully researched book regarding being deaf and learning to grow up in a hearing world. All of the characters are beautifully written and the landscape and weather in Ontario are as much a character in the story as the people in it. The second part of the story, taking place in France during WWI, is also beautifully written but painful. So hard to read about. The war conditions, the shelling, the war torn country side, the mud and rain and cold, and the horror of the death encountered, not only of the men fighting, but the animals - horses and mules slaughtered by the thousands. The family and the young girl encountered at the beginning of the story are not the same people at the ending of the story. They grew up and lived through those war torn years, and some died. How they did it and how they coped is beautifully told. This novel is partially inspired by the experiences of the Frances Itani's deaf grandmother. It is the story of Grania, a little girl growing up in southern Ontario in the early years of the 20th century, who is struck deaf by scarlet fever at the age of five. We first meet Grania as she and her family try to come to terms with her sudden disability. When she is nine she's sent to the nearby Ontario School for the Deaf in Belleville for seven years of segregated education, where she's allowed no This novel is partially inspired by the experiences of the Frances Itani's deaf grandmother. It is the story of Grania, a little girl growing up in southern Ontario in the early years of the 20th century, who is struck deaf by scarlet fever at the age of five. We first meet Grania as she and her family try to come to terms with her sudden disability. When she is nine she's sent to the nearby Ontario School for the Deaf in Belleville for seven years of segregated education, where she's allowed no visitors or trips back home. The story continues with Grania growing up and falling in love with Jim Lloyd, a hearing man she meets through her job at the school hospital. The two marry but are soon separated by World War I when Jim goes overseas to work as a stretcher bearer in an ambulance unit. At this point the story splits the narrative between both of them, and we follow both Grania and Jim during the war years. Unfortunately Frances Itani didn’t have good editorial advice. If she’d had good editorial advice she might have written two good novels instead of this one weak novel. The problem for Itani is that she wanted to tell two stories: one of the experience of a young girl growing up deaf at the turn of the century and one of WW1 trenches (because what Canadian literature needs is *another* WW1 Western Front narrative…). How are these stories connected you ask? Very, very tenuously and not at all in Unfortunately Frances Itani didn’t have good editorial advice. If she’d had good editorial advice she might have written two good novels instead of this one weak novel. The problem for Itani is that she wanted to tell two stories: one of the experience of a young girl growing up deaf at the turn of the century and one of WW1 trenches (because what Canadian literature needs is *another* WW1 Western Front narrative…). How are these stories connected you ask? Very, very tenuously and not at all in a way that might be loosely construed as interesting. The deaf girl, Grania, meets and falls in love with Jim in the span of six or seven pages and then he’s off to war. This rapid courtship isn’t a historical problem - certainly many couples married and separated for the duration of the war - the problem is that the reader spends the first two hundred odd pages with Grania as she grows up, figures out deaf culture, finds herself, and then with unconvincing speed and heavy-handed touches of intimacy (she says his name “Chim” instead of “Jim” and this is supposed to be satisfactory evidence of their love) she falls in love. Unconvincing I say because the decent into love isn’t depicted. We lose a year or two of Grania’s life and those years just happen to be when she meets and falls in love with Jim. So while the reader cares very much about Grania having experienced her difficult and painful maturation, we care not a whit for her relationship with Jim. This lack of concern is a problem because the rest of the book - the second half that is (or the second novel as it should have been) - is taken up with Jim’s experiences on the Front (the occasional return to the home-front is even more trying as we try to believe Grania’s misery and longing, but can’t because we don’t believe she fell in love in the first place). Cue the usual descriptions of rats, shell holes, dead and dying best friends, whores and friendly Belgian farmers. There’s no defense for terrible WW1 writing: if it’s going to be poorly written, just don’t bother. It’s not exactly a genre lacking in nuanced exploration or thoughtful consideration. Should really be 3.5 stars, but I rounded down. I adore the premise of this book: a deaf girl growing up in Canada in the early 1900s who falls in love with a hearing man who goes away to war. I love war stories, especially involving women, I love love stories, and Grania’s deafness adds a really fascinating dimension to the old war romance story. A+ for the general plot idea. The problem is in the execution. The first third of the book is quite interesting and lovely – it’s all about Grania grow Should really be 3.5 stars, but I rounded down. I adore the premise of this book: a deaf girl growing up in Canada in the early 1900s who falls in love with a hearing man who goes away to war. I love war stories, especially involving women, I love love stories, and Grania’s deafness adds a really fascinating dimension to the old war romance story. A+ for the general plot idea. The problem is in the execution. The first third of the book is quite interesting and lovely – it’s all about Grania growing up deaf, her interactions with her family, and her education. There was some seriously beautiful writing in the first bit. The problems started with the introduction of Jim, the love interest. He just appears, they fall in love, and are married. Within like a chapter. We don’t get to see them falling in love, we’re just told that they ARE wildly in love. I feel like this has been happening in the books I’ve been reading lately a lot – there’s supposed to be an epic love story, but we don’t actually see the two characters falling in love. We get a meet-cute, and then we’re told they fall in love and have this connection that transcends everything else. Um, okay? This feels like lazy writing to me. Don’t TELL me how in love they are or how much they miss/understand/worship each other, SHOW me. I would have loved to read about Grania and Jim’s courtship – what was it like for a deaf girl to date a hearing boy in the early twentieth century? I don’t know, because Itani skipped over this part completely. I was disappointed. Then the war starts, and Jim goes off to the front lines as a stretcher bearer. There were some beautiful passages in the novel during Jim’s part, but it was nothing really new (war is hell, soldiers get numb, and so on) and because I didn’t see the courtship between Grania and Jim, I didn’t really feel like I knew Jim so I had a hard time caring about him at all. In fact, I ended up being more interested in Grania’s relationships with Tress, Kenan, and Mamo than her relationship with Jim. Which is not a bad thing by itself, but I don’t think this was what the author intended, and also it made me kind of bored with Jim’s chapters. So, I think this book got off on the right foot and I really liked the concept behind it, but I also think it could have used some editing and revision. It’s a little disappointing – there’s so much potential in this story, but by the end it just kind of fell flat. A good book, but it could have been great. The book divides neatly into two distinct segments, and frankly I wondered why the author didn't make the second part a sequel. It moved away from Grania's story and became a historical fiction account of her husband's WWI experience in Europe. This part of the story was well researched, but a little on the graphic side. It was a definite contrast to the more tender telling of Grania's childhood in part I. I didn't enjoy this part as much, though it did come to a satisfying conclusion. This is a tender and deeply moving book. Frances Itani tells the story of a deaf woman (loosely inspired on her own deaf grandmother), waiting for her young husband’s return from WWI with superb prose. The complexity of what is or isn’t communicate in every relationship, the loneliness of disconnect, and ultimately the healing power of love, family and friendship is weaved through the plot with mastery. I am looking forward to Itani’s next book. I liked this novel but I definitely didn't love it. Itani focused more than half the book on the war. I was hoping she would've wrote more on Grainy's experiences at school where she spent the majority of her adolescence. I feel that if she spent more with Grainy during those years I would've then felt a deeper connection to her. Instead she skips over from the age of 9 to 19 within a few pages. The courtship between Grainy and Jim is very short due to his enlistment in the war but I wish Itani I liked this novel but I definitely didn't love it. Itani focused more than half the book on the war. I was hoping she would've wrote more on Grainy's experiences at school where she spent the majority of her adolescence. I feel that if she spent more with Grainy during those years I would've then felt a deeper connection to her. Instead she skips over from the age of 9 to 19 within a few pages. The courtship between Grainy and Jim is very short due to his enlistment in the war but I wish Itani wrote more of their relationship even though their courtship was short. Once again I didn't really connect with them as a couple. Then once Jim leaves for the war, Itani continues with their relationship through correspondence and flips between these two characters. The majority of the novel was on Jim and what he was going through. The aspects of war, as horrible as they were became very repetitive in the book. Itani touches on Grainy's education and how deaf students were seen as outsiders. She does a wonderful job explaining how deafness occurred through disease and the effects of this tragedy, especially during war time. I also found it very interesting how sign language was perceived so negatively. And in many instances was banned as a form of communication. I enjoyed this book. I liked the different perspectives you get from the family members about Grania's deafness. It is a part of history I never really thought about. One thing this book made me realize is I really don't like reading stories about world war one. Just the senseless human loss grates on me. It is so sad. But, at the same time it is good to remember. I absolutely loved this book. I didn't want it to end. Definitely one of my all time favorites and one I will read again, which I rarely ever do. Frances has done such a beautiful job of creating a family you can't help but fall in love with. Rarely have I read a book where I loved so many of the characters so much that I wanted to know their own stories too, individually! I found the perspective of a deaf woman and other deaf characters, fascinating. So much so I actually stopped part of the way I absolutely loved this book. I didn't want it to end. Definitely one of my all time favorites and one I will read again, which I rarely ever do. I found the perspective of a deaf woman and other deaf characters, fascinating. So much so I actually stopped part of the way through the book and Googled the school and the old newspaper articles. Very well done, and I loved that it was all so real and never so bleak as to feel hopeless. Frances brought me into the hell that was WWI and it broke my heart. I think the best compliment I can pay is that she was able to make me fully understand and feel what it may well have been like to be both a soldier in the trenches, and a family member waiting breathlessly, in limbo, back at home in Canada. Beautifully balanced, riveting, and thought provoking. Another wonderful book about trench warfare is Three Day Road; I highly recommend it. Thank you Frances Itani for writing this masterpiece. I've nominated it as my choice for the 2011 Canada Reads. What more can I say? Read Deafening, it is an absolute treasure. Wow! If L.M. Montgomery and Erich Maria Remarque had a baby. . . This is the first of Itani’s books that I have read. It won’t be the last. Her slow, quiet, cumulative writing style captures simple details one on top of the other to create unforgettable images and precious characters I will carry with me for some time. Deafening is a book about love, loss, language and the ability of the human spirit to carry on, to bear the sorrow—ours and others—and to survive, if not triumph. In the book, we l Wow! If L.M. Montgomery and Erich Maria Remarque had a baby. . . This is the first of Itani’s books that I have read. It won’t be the last. Her slow, quiet, cumulative writing style captures simple details one on top of the other to create unforgettable images and precious characters I will carry with me for some time. Deafening is a book about love, loss, language and the ability of the human spirit to carry on, to bear the sorrow—ours and others—and to survive, if not triumph. In the book, we learn that there are no miracles in the traditional sense of the word, but that miracles lie in our ability to move forward, anyway. Find a cozy spot and take some time with this book. You won’t be sorry. For a review that does this book justice, see Ron Charles. "Set on the eve of the Great War and spanning two continents, DEAFENING tells the story of Grania, a young deaf woman living in small-town Ontario, who falls in love with Jim, a hearing man. In wonderment, they create a new emotional vocabulary of sound and silence. As the First World War explodes across Europe, Jim leaves to become a stretcher bearer on the Western Front, a place filled with unforgiving noise, violence and death. Through this long war of attrition, Jim and Grania attempt to sustain their love in a world as brutal as it is beautiful." I know somewhere in this book is a beautiful story. The first 75 pages were pretty fascinating. The story of Graine as a child, and her struggles with being deaf were very interesting, and rung true. However, somewhere along the lines she grew up and fell in love.. which the book failed to spend any time on! At the end of one chapter, she meets Jim, and then, in the next chapter they are getting married!! HELLO! Where is the love story??? So yeah, I tried, but I could not trudge through the rest o I know somewhere in this book is a beautiful story. The first 75 pages were pretty fascinating. The story of Graine as a child, and her struggles with being deaf were very interesting, and rung true. So yeah, I tried, but I could not trudge through the rest of the book, because frankly, I didn't give a crap about this Jim character that randomly showed up. And, all Graine could talk or think about was Jim - and yet, I have no idea why, because there was zero love story. I have read many more books about WWII than WWI, so this book was interesting to me historically. The depictions of the waste and suffering of war are not new themes, but they are well handled here. I very much liked the quotes from a school newspaper that precede many chapters, and show the war through children's comments. As with WWII, people felt patriotic in supporting the war (and were even cruel to those who did not enlist), and this is such a contrast to the views on war of my generation. I have read many more books about WWII than WWI, so this book was interesting to me historically. The depictions of the waste and suffering of war are not new themes, but they are well handled here. I very much liked the quotes from a school newspaper that precede many chapters, and show the war through children's comments. As with WWII, people felt patriotic in supporting the war (and were even cruel to those who did not enlist), and this is such a contrast to the views on war of my generation. The influenza epidemic is well described--I had not realized that so many people died, lost their hearing, lost their hair, etc. The unique thing about this book, though, is the perspective of someone who cannot hear. The romance between Grania and Jim is tenderly described, as he is attracted to her quiet strength, and her deafness becomes an endearing tie between them as they share with each other the differences in their hearing/non hearing perspectives. The other characters (Grania's grandmother, parents, sister, brother-in-law and townspeople) are also both interesting and believable. 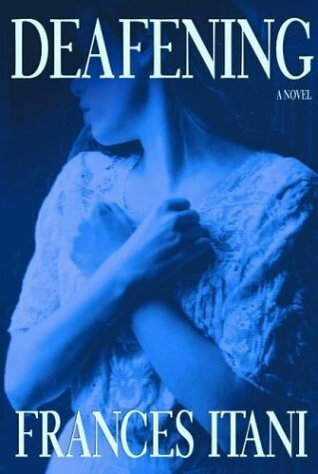 This masterfully written saga takes us from 1903 through 1919 during the life of Grania O'Neill, a young woman, deaf since an illness she had at a young age. Never have I felt as though I somewhat understood the world of the deaf until this book. The characters in this novel are exceptionally well described in all aspects of their personality, and there are lots of memorable characters. Grania, her mother, her grandmother "Mamo", her childhood friends, and the love of her life -- Jim Lloyd, a man This masterfully written saga takes us from 1903 through 1919 during the life of Grania O'Neill, a young woman, deaf since an illness she had at a young age. Never have I felt as though I somewhat understood the world of the deaf until this book. The characters in this novel are exceptionally well described in all aspects of their personality, and there are lots of memorable characters. Grania, her mother, her grandmother "Mamo", her childhood friends, and the love of her life -- Jim Lloyd, a man who has hearing. When reading the chapters written through Grania's eyes the book is graceful and almost quiet, then switching to Jim's accounting of the horrors of the war it becomes "DEAFENING". This is a very powerful story evoking dramatic images of WWI and the struggles of a deaf young woman to be accepted as a "normal" and even gifted person. This was an interesting read - at times poignant and heartbreaking, but informative as well. I don't often read novels about WWI but have read Itani's "Remembering The Bones" and found it captured my attention so thought I'd give it a try. So glad I did! Others noted that the two stories were loosely connected, but I found it provided interesting viewpoints from the perspective of the character and tied together just right. This story didn't romanticize or glamourize the horrors of war. It also p This was an interesting read - at times poignant and heartbreaking, but informative as well. I don't often read novels about WWI but have read Itani's "Remembering The Bones" and found it captured my attention so thought I'd give it a try. So glad I did! Others noted that the two stories were loosely connected, but I found it provided interesting viewpoints from the perspective of the character and tied together just right. This story didn't romanticize or glamourize the horrors of war. It also provided a unique look into living with deafness and learning/communication techniques in use at the time. I actually learned a lot even though it was fiction. Frances Susan Itani is a Canadian fiction writer, poet and essayist. Itani was born in Belleville, Ontario and grew up in Quebec. She studied nursing in Montreal and North Carolina, a profession which she taught and practised for eight years. However, after enrolling in a writing class taught by W. O. Mitchell, she decided to change careers. Itani has published ten books, ranging from fiction and po Frances Susan Itani is a Canadian fiction writer, poet and essayist.